Palo Alto Animal Services will evaluate a skunk captured by a custodian at lunch with a trash can from a short Palo Alto Senior High School hallway leading to English room 219. When it was spotted at the end of lunch and the administration was made aware of the situation, the custodial team closed the classroom door to encourage on-looking students to report back to their classrooms. 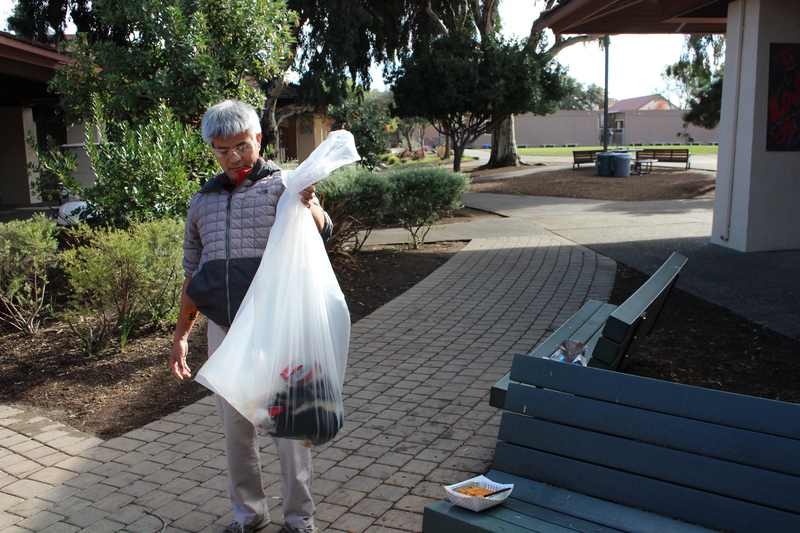 Shortly after, Custodian Tap Phou captured it, prodding it with a metal rod into a trash can. According to Assistant principal Jerry Berkson, the administration acted on the spot. Senior Callum Day Ham, who said he has extensive experience capturing skunks, was one of the first on the scene. “We kind of just played it by ear, and got lucky that there was a custodian that was willing to go get the thing, and bagged the thing, and now we are just waiting for animal control,” he said. The skunk was hiding under a storage bin in the hallway leading up to to the classroom, holding teacher Hunter Reardon and juniors Aaron Chen and Jeremy Xu captive. Later, they were instructed to slowly exit the building one by one.